In Chapter 7 of my eBook I have explained the complete theory of Morning Panic and Afternoon Fade pattern and Infosys on Friday the 13th ( 😀 ) was a perfect setup to make truckload of money. Let me explain my intraday shorting strategy to understand when to short a stock with Morning Panic and Afternoon Fade chart pattern..
Infosys results were not as per market expectations and so morning panic was expected in the stock. The stock opened 10% gap down from Thursdays closing and then we see the following for the whole day. Few things to note in the above chart that are explained in my eBook. Morning panic is followed by spike. We saw it in the first few minutes of trade. The Spikes are never very strong. Few Shorting opportunities in the spikes as well as when morning low cracks. 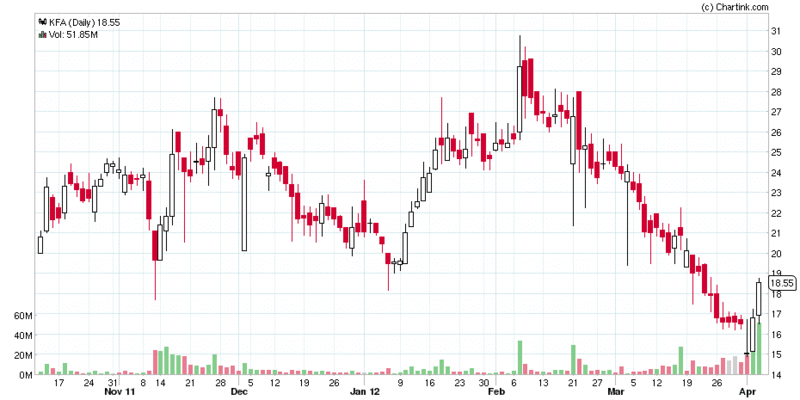 So let us understand morning panic and afternoon fade chart pattern once again with Infosys. The gap down is clear indication of morning panic and then it becomes a waiting game to verify the pattern formation and trade accordingly. In the above chart I have marked 5 vertical blue lines from point 1 to point 5. Each of those points can be an entry point for going short on Infosys depending on your risk appetite. So let us understand what each point signifies. Gap down opening followed by a spike which we see fading at around 9:30 AM. Things are happening very fast in the stock and it is not able to make sustainable rally after the gap down. This could be your first chance to go short in the stock. The spike after Gap down could be mainly because of short covering from people who are short on stock from the previous day. The first spike is very risky position and is recommended only for active traders. Shorting at point 1 is more of an anticipatory pattern (pattern not actually formed yet but is giving signals that it may form soon). So we can take position early for more gains. You can either take small position or play the waiting game. Management interviews in news channel can create spikes in the stock and can even start a recovery process and if you see recovery you should be ready to take a stop loss. We see management views are not very positive and so there will be no hope for intraday recovery for this stock apart from short covering and so we move to point 2 where we see yet another spike which is not very long lasting and so you can go short here or add more to your initial position. 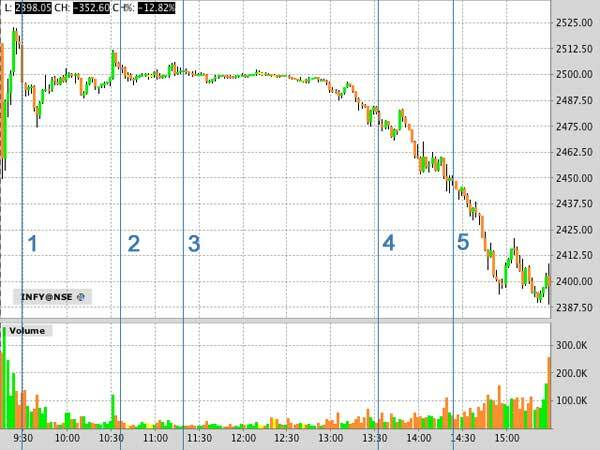 Even if you are not convinced at point 2 you can go short at point 3 because now you can clearly see that spikes are all fading too fast and so there is not much buying happening in the stock. Even if you missed the above shorting opportunities there are couple more sure shot ways to make money from Infosys. 2450 was a morning low and 2475 was a low after the morning low and so stock below 2475 can be yet another level to go short in the stock. Even if you missed 2475 crack, you can go short when 2450 cracked. Crack of morning low means afternoon fade to follow which is one of the safest patterns to make money. Such perfect setups are very rare but when you get them you should be ready to cash on them because even if you shorted at 2445 i.e. after cracking the morning low of 2450 you can easily target for 2410 or 2405 because 2400 may or may not crack the same day and you are taking position after 2 PM. Note that this post is about what could have been done and same thing may not repeat on Monday because there may be more short covering. Trade when you have the ideal setups because few ideal setup trades in a year can make you lot more money than trading for every stock tips. What is Technical Analysis – Why It Works?